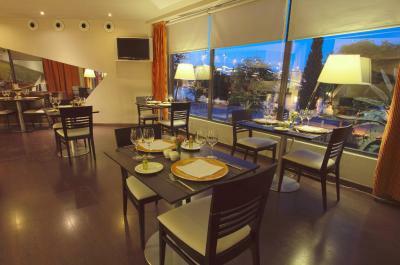 Lock in a great price for Ribera de Triana Hotel – rated 8.5 by recent guests! Hotel was modern and clean. Staff was pretty friendly, some more than others ... some acted like they were working at the 4 Seasons, not a 4-star hotel in Seville, Spain. Overall, nice property. It is a great value for the money, even if it is not right by the main historical area of town I enjoyed the walk to it every day crossing the bridge over the Guadalquivir right next to it. Good to be in Triana but an easy walk to town. Beds comfortable, bathroom spacious. 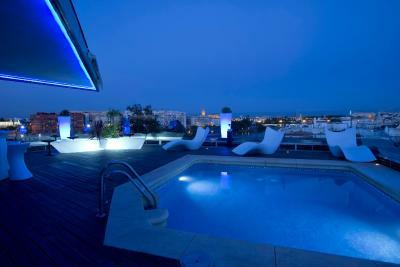 Spectacular views from roof bar, especially at night. Handy places for breakfast. Room was spacious and clean though this hotel is in need of a little TLC. Location is great. 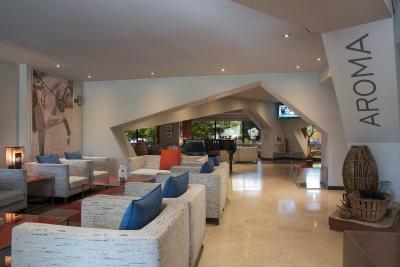 The quality of the facilities and car parking under the hotel. Good location, decent staff, clean hotel, and no-frills room. Four stars seems a stretch, but lets go with it. Great hotel, pretty good restaurant except only had house wine by the glass. 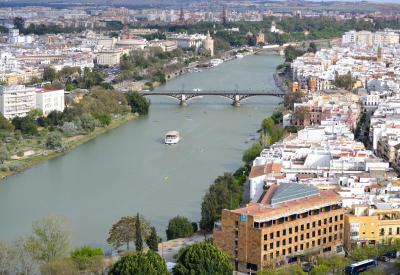 Triana neighborhood is worth exploring but a bit of a longer walk into Seville which is where we spent more time. We stayed on a large room with river view, but that’s all the good part! Staff are rude, really rude!!! Breakfast too simple. Bed gave us back pain, no parking, I did have to park like 1/2 mile (600m) away. We decide to anticipate our checkout by one night!! Thats tells everything! Great rooftop bar over looking the city and good breakfast. The location was excellent and parking was available for a fee and well worth it. Ribera de Triana Hotel This rating is a reflection of how the property compares to the industry standard when it comes to price, facilities and services available. It's based on a self-evaluation by the property. Use this rating to help choose your stay! 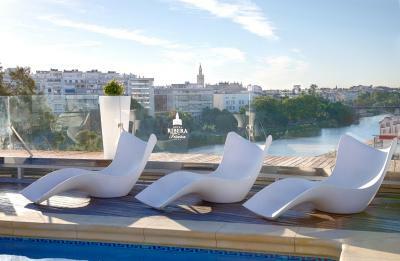 Set in Seville’s famous Triana district, Ribera de Triana Hotel overlooks the River Guadalquivir and has a rooftop pool with impressive city views. 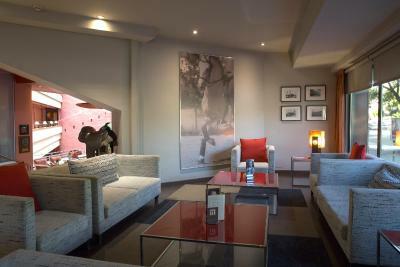 It offers a free gym, a spa and air-conditioned rooms with free Wi-Fi. 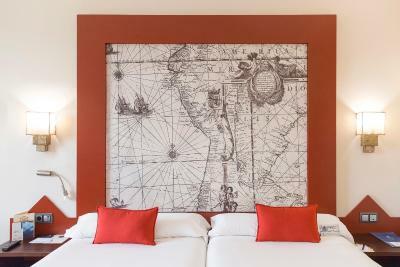 The bright, spacious rooms at the Ribera de Triana feature high-quality bed linens, satellite TV and a mini-bar. Some offer views over the river. 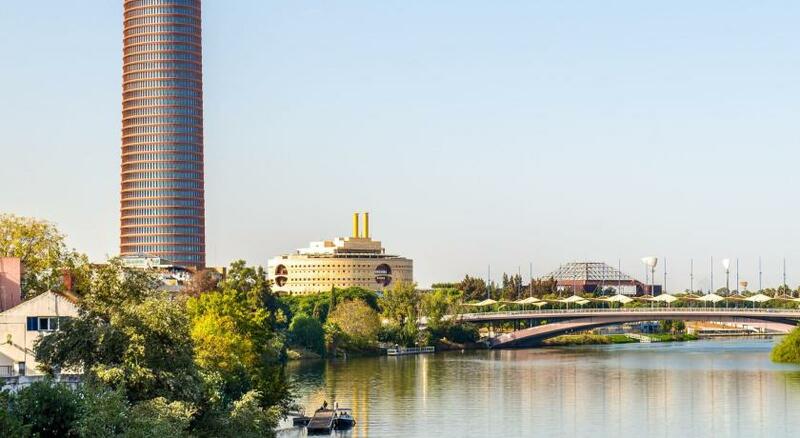 The Ribera de Triana is just across the river from the city center, and is a 20-minute walk from Seville Cathedral, La Giralda, El Alcázar and the bullring. Isla Mágica Theme Park is 0.6 mi away and you can reach the Fine Arts Museum in 15 minutes by foot. 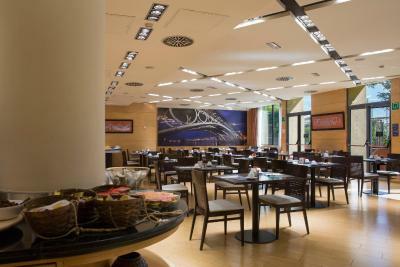 The hotel restaurant serves a buffet breakfast, and a range of Italian and international dishes. 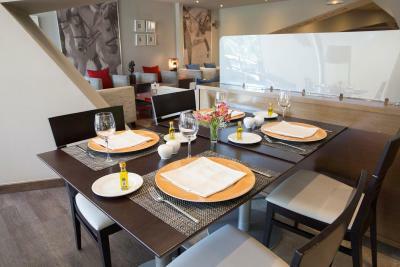 The hotel can also provide room service and packed lunches on request. 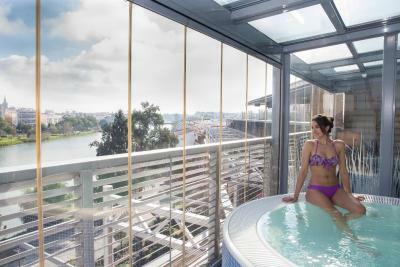 The spa features a hot tub with river views and a Turkish bath. Relaxing massages are available on request. 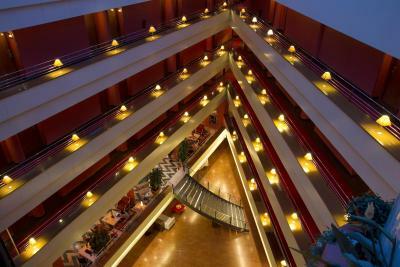 City tours, and car and bicycle rental are offered at the 24-hour reception. 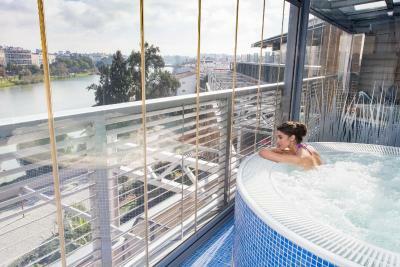 Seville Airport is a 20-minute drive away. 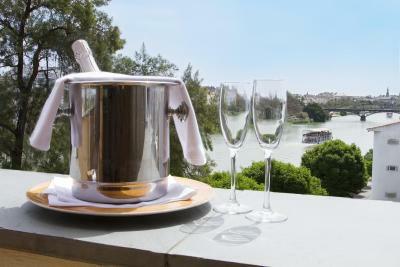 Triana is a great choice for travelers interested in city walks, friendly locals and ambiance. 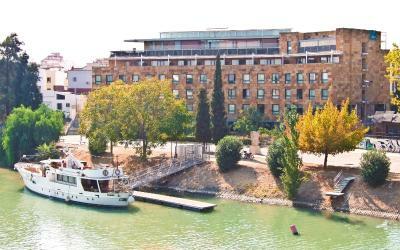 When would you like to stay at Ribera de Triana Hotel? 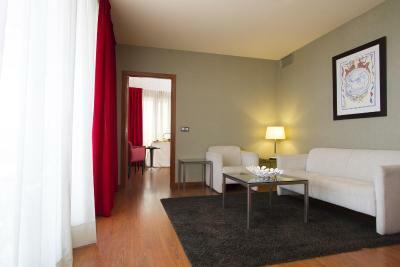 The bright, spacious room offers views of the Triana district. 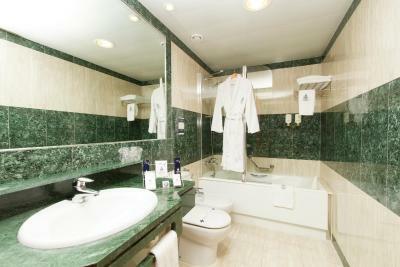 It has air conditioning, satellite TV, a minibar, safe and suit press. 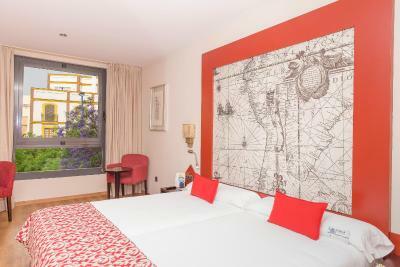 The bright, spacious room offers views of the Guadalquivir River or the Triana district. It has air conditioning, satellite TV, a minibar and a safe. 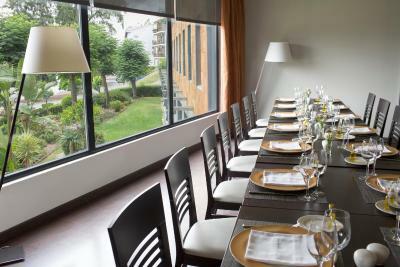 The bright, spacious room offers views of the Triana district. It has air conditioning, satellite TV, a minibar and a safe. 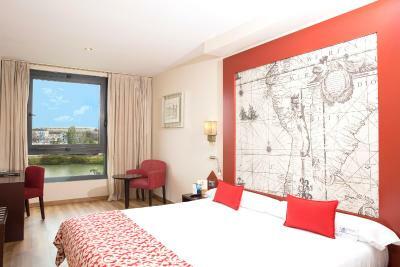 The bright, spacious room offers views of the Guadalquivir River. 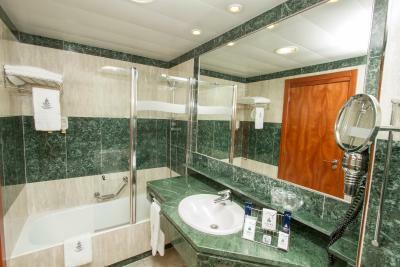 It has air conditioning, satellite TV, a minibar, safe and suit press. 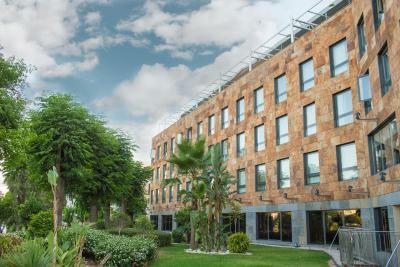 The building, an old Seville neighbourhood by the Cristo de la Expiración Bridge, on the banks of the Guadalquivir River, was transformed into the exquisite 4 star hotel with a modern design and Seville essence that all our guest know well, through its careful expansion and reorganization. 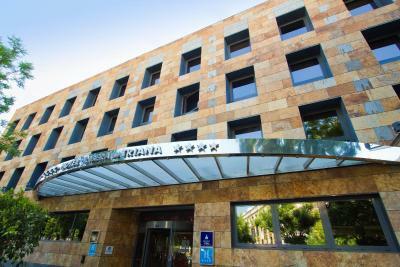 Hotel surroundings – This neighborhood is a great choice for travelers interested in city walks, friendly locals and ambiance – Check location Great location - show map Guests loved walking around the neighborhood! 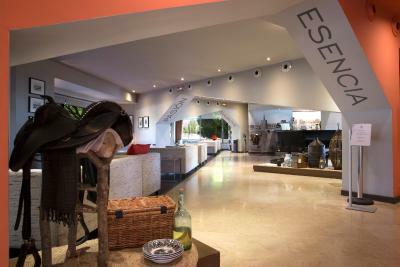 House Rules Ribera de Triana Hotel takes special requests – add in the next step! Ribera de Triana Hotel accepts these cards and reserves the right to temporarily hold an amount prior to arrival. Please note that the spa is open from 8:30 to 22:00 and is closed in July and August. Access is free of charge for all guests. Please note that parking cannot be reserved in advance. Please note that Ribera de Triana Hotel reserves the right to charge guests for the full amount of the reservation upon arrival. 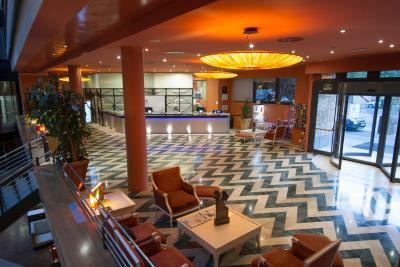 Please inform Ribera de Triana Hotel of your expected arrival time in advance. You can use the Special Requests box when booking, or contact the property directly using the contact details in your confirmation. Hotel car park was full. However helpful hotel staff directed us to nearby public car park with hotel rates. Location. Upgrade to room with balcony was major bonus. The storage area for the bikes could be better located. Location and ease of renting bicycles and easy access to bike paths/routes. No Kettle in room and claims to have a spa. 1 x 4 person max Jacuzzi and a Turkish bath available on site but only 1 changing room and 1 shower for those that want to use it. Had an executive suite which meant a lovely terrace overlooking the river. The room was large and airy. Air con was quiet and effective. The location was stunning - overlooking the river as well as perfect as it had one of the tourist tour bus stops directly outside the door as well as a city bikes pick up / drop off point and a local bus stop. Over the Road was a shopping centre. There was noise from the adjacent rooms and outside. Great location. Over the bridge from most hotels but this was perfect for us. We selected a room with a balcony which was very spacious a perfect for a siesta after a long day walking around visiting the sites. We didn’t eat at the hotel so can’t comment on the food but the cocktail bar was lovely with a great view of the city. Would definitely recommend this hotel. We liked the hotel, especially the interior design. The staff was overall friendly and willing to help, but the English language barrier was noticeable for me at least when I had to interact with them. I don't mind that as this is an usual issue in Spain. Lovely big room and big comfy bed. Lovely little extras put in the bathroom too which was a great touch! Staff was unfriendly and unhelpful. Good location, easy access to main areas of town.